Hello! 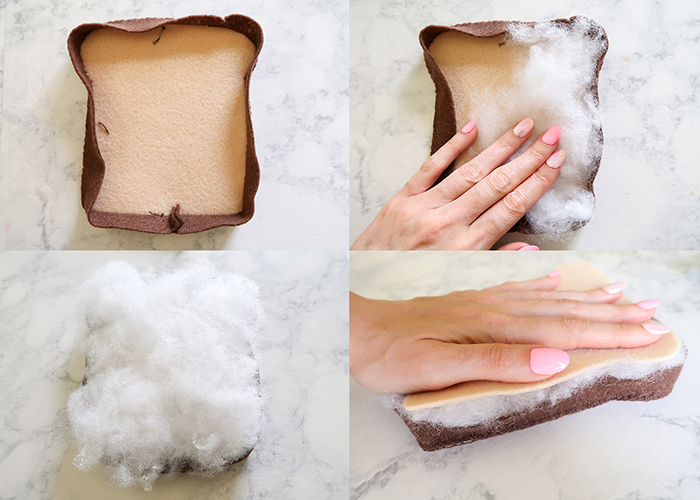 Today I’m going to be showing you how to make this Felt Food Sandwich Bread! 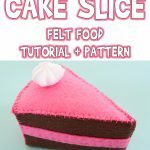 Like all my felt food tutorials, I’m also including a printable pattern and lots of photos to help you along the way. 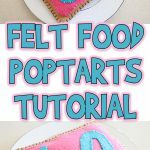 It’s the perfect start for making a felt food sandwich, and I’ll be sharing how to make a variety of fillings soon. Let’s get started! 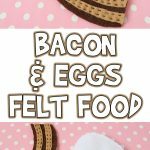 Check out all of our felt food sewing patterns, and especially our felt sandwich fillings patterns! Light brown or cream felt. 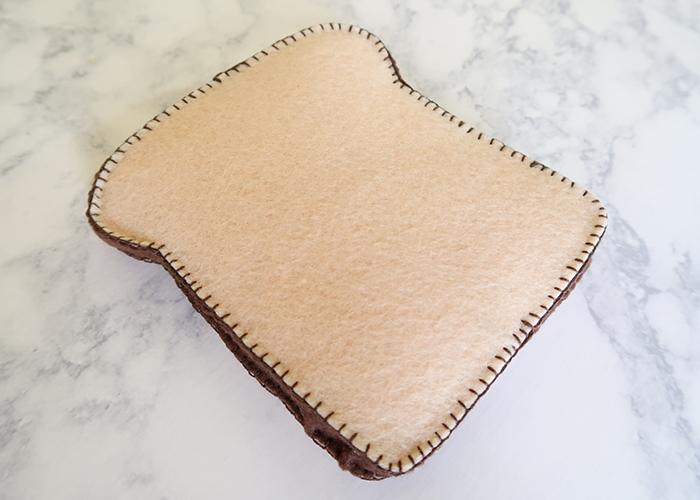 I recommend using stiffened felt for nice, flat bread. 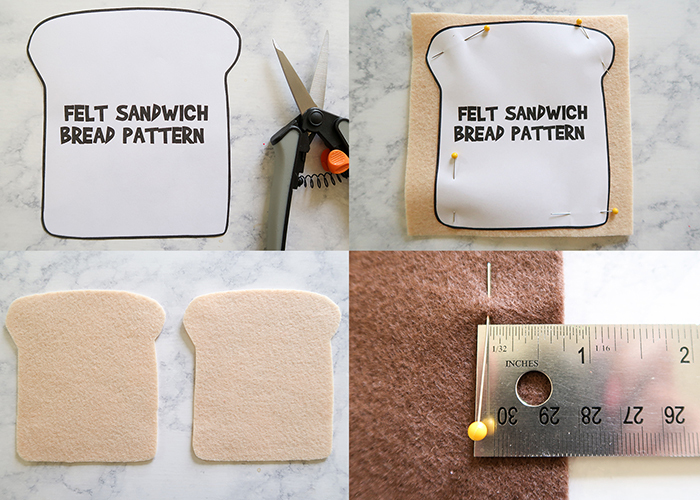 Start by cutting out the sandwich bread pattern. 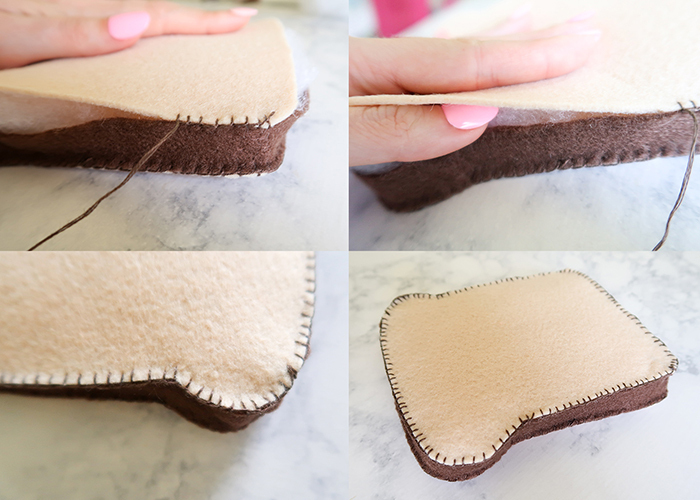 Pin it onto your light brown or cream felt, and cut it out. You’ll need two pieces for each slice of bread. Now take a sheet of brown felt, and measure 3/4 in inwards along the long side. 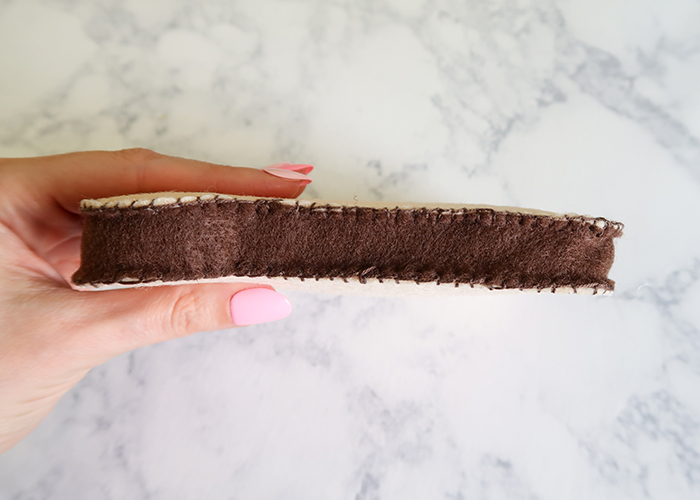 Place a few pins along the 3/4 inch mark, and cut along them so you end up with a 3/4 inch wide long strip of felt. Take that strip you cut off and pin it along the new edge. Cut a second strip off, using the first as a guide. So you’ll have two long strips of brown felt. Thread an embroidery needle with three stands of embroidery thread, and place the the two felt strips together. Sew the one end together. This way you have one long edge strip. This will be the crust edge of your bread. 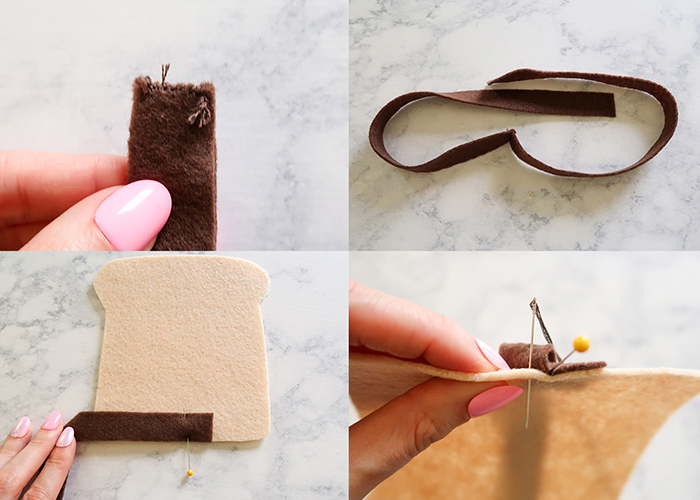 Make sure when attaching the crust strip to the bread that the stitched side is facing the center of the bread piece so the stitches won’t be visible on the outside. Now take one end of the crust strip and pin it to the bottom of one bread piece. 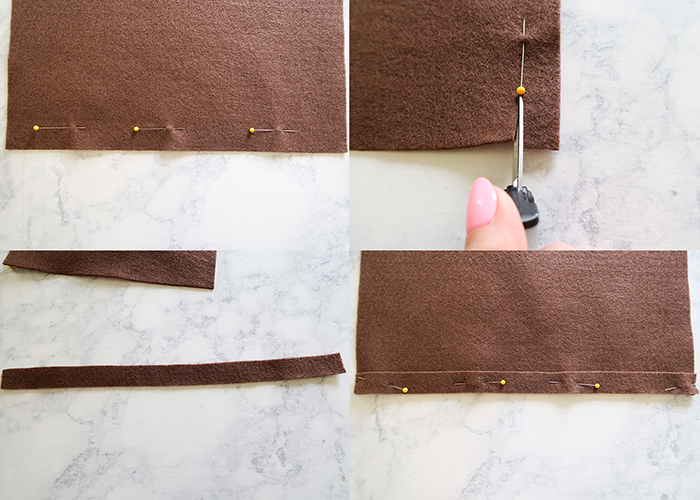 Make sure the pin is in the center of the bottom and the end of the brown felt extends about a 1/2 inch past the pin. 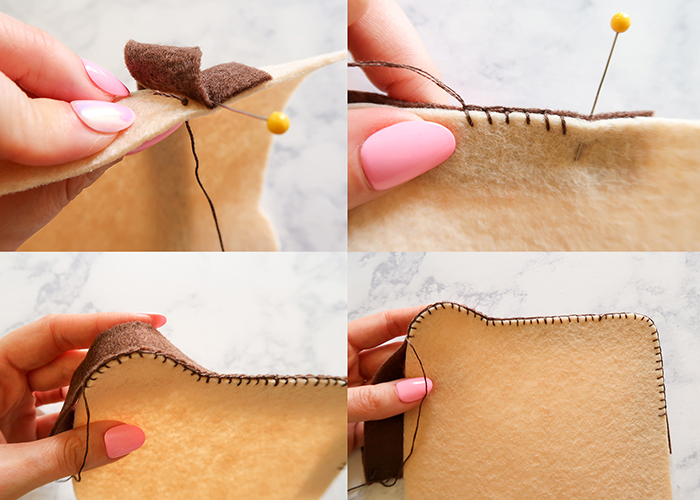 Insert your needle between the two layers of felt. 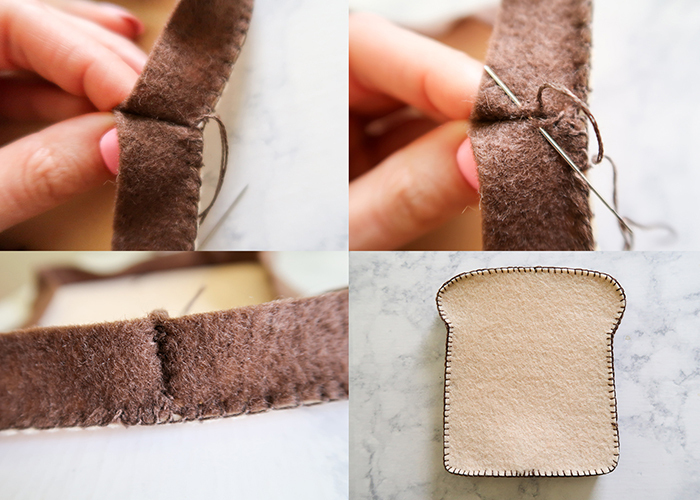 This way your knot will be hidden inside.Start stitching around the edge of your bread, using a blanket stitch. Adjust the crust piece to fit the curves as you go. If you need more thread, just knot it off on the inside and start a new thread. When you get the the end, this is what it should look like.Trim the crust felt ends to about 1/2 inch, and flip them around so they’re pointing inside the piece of bread. 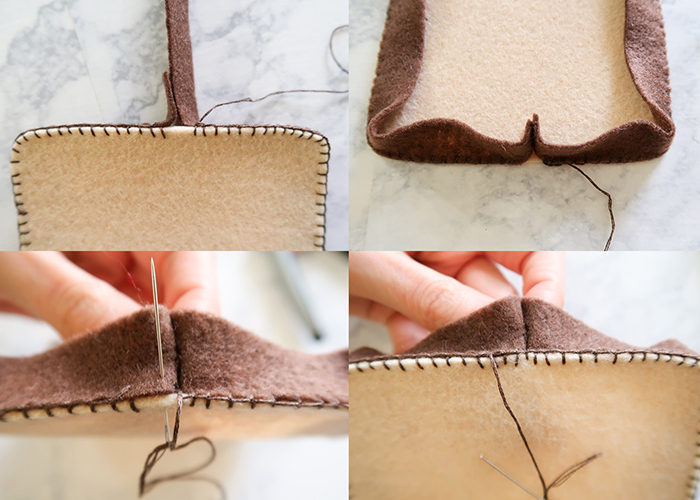 Pinch them in place, and finish stitching along the bottom. 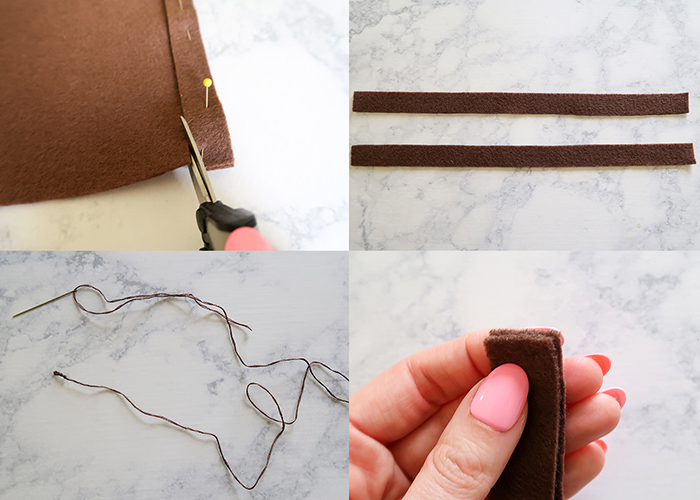 Then stitch up the seam where the two brown pieces meet, using a small whip stitch. Knot it off, and we’re halfway done. This is how the outside of the bread piece should look like. And the inside! 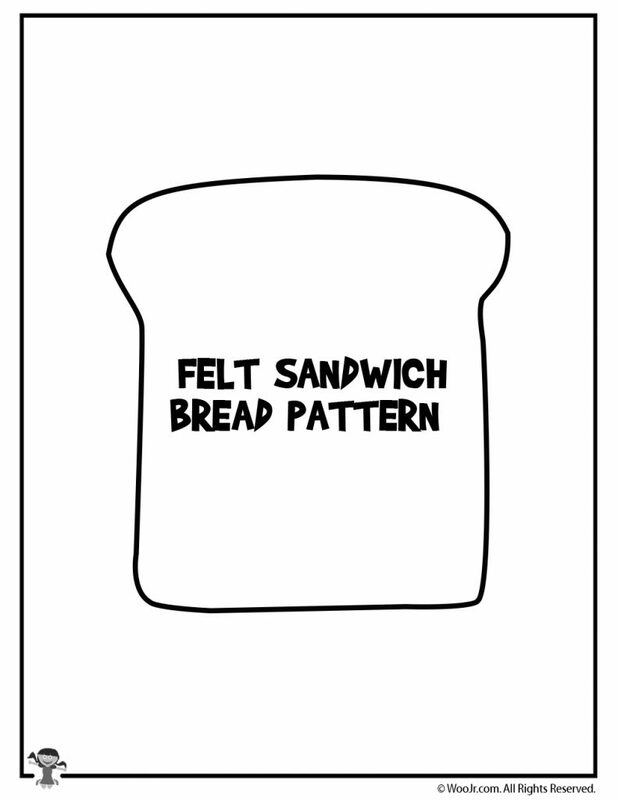 Now take your fiber fill, and spread it out flat inside your bread. Use your hand to feel that it’s even, and over fill it slightly so the final piece of bread will be firm. Now set your second piece of bread on top, making sure that the corners and curves are lined up as closely as possible. If the top if too twisted, it will cause the whole piece of bread to twist. 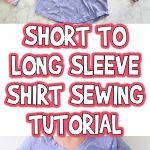 Start stitching around the top the same way you attached the bottom, using your thumb to press in the fiber fill in and put of the way of the stitches as your go. 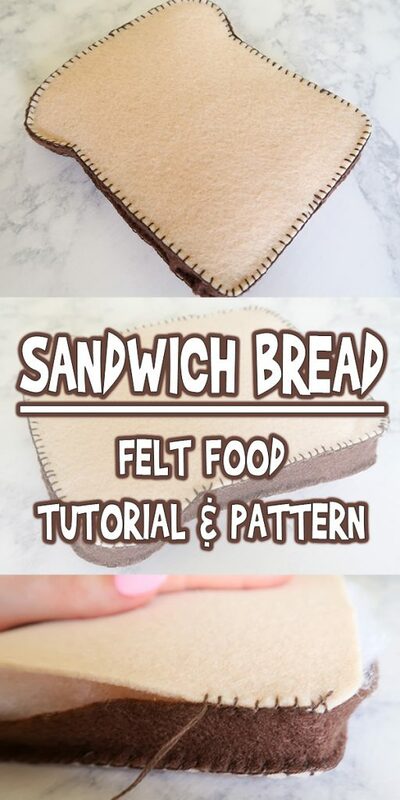 Sew all the way around the top, and you have a piece of bread! 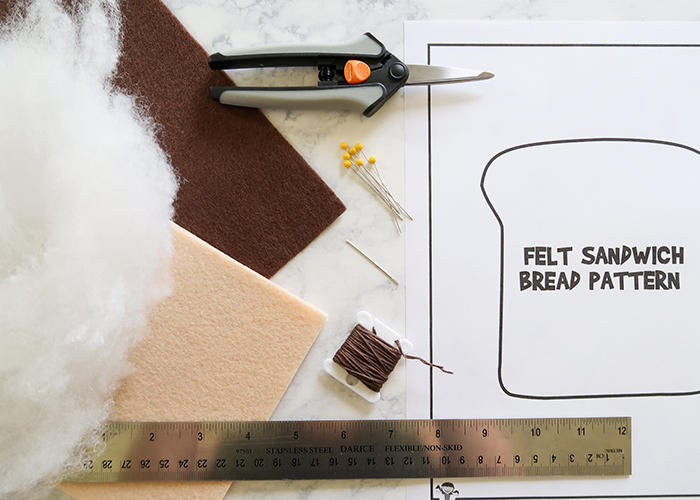 Using the stiffened felt makes sure your bread is nice and flat. Now you just need to make one more slice, and you’ll have enough bread for a sandwich! 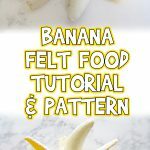 Click on the pattern below to be taken to a page where you can print it out. 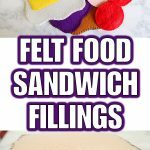 I hope you enjoy making this felt food sandwich bread!